You can have a stack load of fun with a Temporary Tattoo Fundraiser. It's a simple fundraising idea that can fit in to any event. It's also a perfect fundraiser for Schools, Churches and other community groups! Or by buying the temporary tattoos yourself and selling them on. But it's up to you to decide which way will work better for your organization. So what events will the temporary tattoo fundraiser work at? Well, at any event where there are kids and teenagers!!! That could be a fundraising event of any type - a fair, a sports event, or a special date event, like Halloween. As long as you create some excitement around the tattoos, you will be able to make it a success. After you've decided which way you will hold the fundraiser, you will either have to find a company to use, or you will need to source your tattoos from somewhere. Obviously you will want to find the best deal. Just make sure that the tattoos are still good quality. You never ever want to sell a poor quality product... It's one of the things that will stop people from supporting you and your cause! Obviously if you are using a company to sell the tattoos you won't need to worry about this. If not you need to put some good preparation into it to make sure you raise the funds you need. 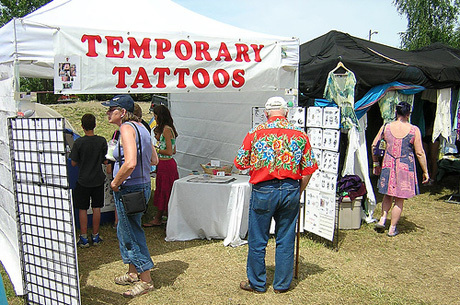 A stand would be the best starting point for selling your temporary tattoos. Have big banners up that are catchy and will draw people over to the stand. To raise funds for your cause of course! You should also have a few sales members walking around at the event selling the tattoos individually, or sending people over to stand. For more info on how to train your fundraising sales team effectively, get yourself a copy of Jack Atwell's book "Let's Raise Money" (click to read my review). You'll find the advice in there invaluable! You will want as many people to know about your fundraiser as possible. It's called exposure. The more exposure you have, the more you will sell, and the more funds you will raise. So obviously you will advertise at the event with posters at your stands, and with your sales team going around informing people. You should also post up posters all around the event with directions to where the stand is. Before the event actually happens you should also promote the fundraiser, so that people who are attending will know about it before they even get there. Like on your website, through your newsletters, your social media accounts, and other announcements and press releases that you release about your event! Read here for great ideas on promoting fundraisers that you could use for your Temporary Tattoo Fundraiser. The temporary tattoo fundraiser can also be run using henna tattoos. It's something you could definitely put some thought into! But essentially this is a really simple fundraising idea that can raise a decent amount of funds. 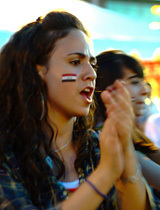 It won't be your multimillion fundraiser, but added onto to an event it will help increase your bottom line quite nicely! So at your next event get excited and start tattooing! Is the Online Apparel Fundraiser which you'll setup through SSA. I highly recommend this fundraiser for all groups like Schools, churches, Sports Teams, etc. Then head up to the sourcing your Tattoo section and do a search for local Temporary Tattoo fundraiser suppliers or businesses.